Lyn Benedict is a penname of author Lane Robins. Lane Robins was born in Miami, Florida, the daughter of two scientists, and grew up as the first human member of their menagerie. When it came time for a career, it was a hard choice between veterinarian and writer. It turned out to be far more fun to write about blood than to work with it. She received her BA in Creative Writing from Beloit College, and currently lives in Lawrence, Kansas. Read excerpts of her novels at Lane Robins’ website. Here’s our Lane Robins page. 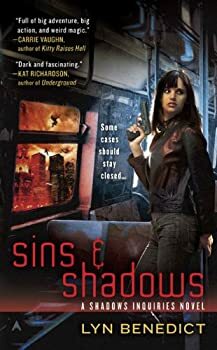 Shadows Inquiries — (2009-2012) Publisher: Sylvie Lightner is a PI who specializes in… let’s say unusual cases. Or at least, she was. Sylvie has dealt with werewolves, the undead, Satanic cultists, and all manner of unspeakable things, all while being hounded by a shadowy government agency that would love to shut her down — And she has always stood her ground. Now, though, she is having doubts. It is becoming harder for her to draw the line between the real monsters and the human ones, and progressively easier to kill. If she doesn’t stop, she fears, she may become one of the monsters herself. When she is forced to watch a friend and employee murdered because of their relationship, she knows that she can’t do this anymore. She is closing Shadows Inquiries for good. The problem is that a man who claims to be the God of Justice wants Sylvie to find his missing lover. And he’s not taking no for an answer. Sylvie is used to being outgunned and outclassed, but this case will push her beyond anything she knew she was capable of, and bring up things about her own past that she never wanted to know. The only good thing about gods is that they prefer their realm to ours. Lyn Benedict also writes political-intrigue fantasy under the name Lane Robins. I learned this before starting Sins & Shadows, and I've been wondering ever since whether I'd have figured it out if I hadn't known. The setting, plot, and prose style are completely different from the Lane Robins books, but there are some echoes in the general themes: love, vengeance, and the havoc that gods wreak when they meddle in mortal affairs. 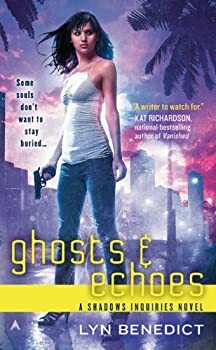 A subplot in Ghosts & Echoes involved Sylvie and a werewolf, Tatya, looking into the disappearance of a young woman in the Everglades. 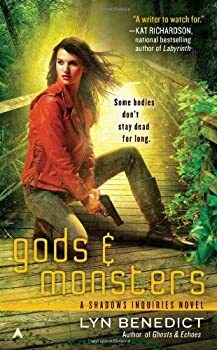 Lyn Benedict picks that thread back up at the beginning of Gods & Monsters. The woman has been found dead in the swamps, along with four others. Sylvie doesn’t want to get personally involved in this case, so she calls the police — but when the police move the bodies, one explodes into flame and the other four shift into animals. Three policemen are killed and some injured, including Adelio Suarez, a cop with whom Sylvie has an uneasy alliance. Now she’s involved whether she wants to be or not.